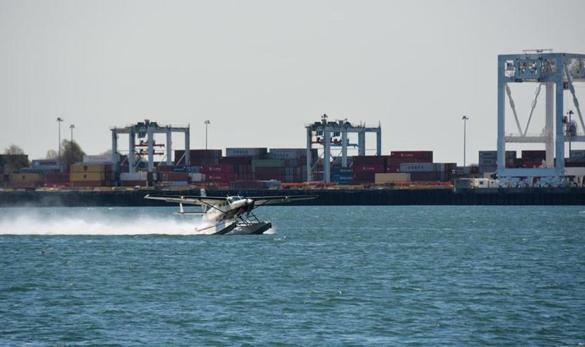 The Hyannis-based airline has acquired the assets of Shoreline Aviation, a Conn. company that billed itself as the East Coast’s biggest seaplane operator. The funding will allow Boston Medical Center to better tailor treatment options to 16 communities across the state. Federal regulators are reportedly considering seeking the action amid the social network giant’s mishandling of users’ personal information. A global team of experts next week will begin reviewing how the Boeing 737 Max’s flight control system was approved by the FAA. An analysis of mobile phone location data found that most weekly shoppers are going to other stores — and many may never return. The company is recalling more than 300,000 vehicles in North America because a transmission problem could cause them to roll away unexpectedly. An afternoon recap of the day’s most important business news, delivered Monday through Friday. These 128 businesses have the happiest employees in the state. Here are sortable lists of the winners, and how we compiled them. Some Jewish families are preparing for Passover without the region’s largest supermarket chain, which has deep roots in the local Jewish community. American Media Inc. is ditching the tabloid after being accused of trying to blackmail the world’s richest man, Jeff Bezos. New data show a sharp reversal from as recently as January when key readings were pointing to a pronounced downturn — a factor US officials have touted as leverage in their push for a pact. Woburn-based Monotype’s reboot opens up a familiar design debate. Is Helvetica perfect, or is it boring? As fears grow that regulators will quash T-Mobile US Inc.’s Sprint Corp. merger, chief executive John Legere is leading a personal crusade to rescue the deal. Bodyarmor’s decision to transfer distribution rights for its sports drinks to Coca-Cola left a sour taste in the mouths of Keurig-Dr Pepper executives. With only one supermarket chain on the island, residents who don’t want to cross the picket line don’t have a lot of options. Shopping on the mainland isn’t easy, and small grocers and boutique fish markets can be expensive. The governor said he wants to renegotiate the contract with the global electronics leader. Beyond raising such philosophical and ethical concerns, the results could complicate the already-fraught debate over brain death and organ donation, experts said. Even if the Red Sox languish in the American League for now, the state’s tech sector will remain a championship contender. The beleaguered taxi industry may benefit from a potential policy change at Logan International Airport. The nearly week-old strike by 31,000 unionized Stop & Shop workers is resulting in barren shelves, stores without customers, and even locations that are closed altogether. Thousands of women had sued the company alleging the surgical mesh caused extreme discomfort. US health regulators ordered two companies to stop sales after saying there isn’t enough evidence that the product — which is embroiled in thousands of lawsuits — is safe or effective. The drugstore chain will pay to resolve federal allegations that it filled dozens of Percocet prescriptions its pharmacists should have known were forged. One by one, union powerhouses that used to reign over swaths of the New England grocery industry, including A&P, Pathmark, and Grand Union, fell into disarray. Finding a spokesanimal can be easier for some insurance companies than it is for others. None on the Supreme Court wanted to say the four-letter word. It’s a tale about a renowned researcher, a prominent CEO, and magenta hair. It’s also a story about how the Marathon brings together strangers, sometimes bonding them in unlikely ways. Across rural America, a bandwidth gap separates some communities from an increasingly digital world where high-speed internet has become a fundamental component of modern life. The council operates out of BU’s computer science department. The list of uses proposed over five decades for this unused city-owned property on Tremont Street in Roxbury extends longer than the Orange Line that rumbles by. Companies scrambling to fill positions are offering higher pay and better hours, and loosening requirements for college degrees. Facebook, Instagram, WhatsApp were down for many people early Sunday morning. Stop & Shop strike is on, but will customers stay away? With awareness of inequality and union approval growing, picket lines may be more successful than they would have in the past. Teams of employees from some prominent Boston businesses took part in a spelling bee that was a fund-raiser for First Literacy. A few adjustments are needed to make them more than a novelty. Southwest Airlines is removing flights with the troubled Boeing 737 Max from its schedule through the peak of the busy summer travel season. Walt Disney Co. will charge $7 a month for its streaming service that debuts Nov. 12, a gambit to undercut Netflix in an increasingly crowded field. The United Food & Commercial Workers union, which represents the 31,000 workers on strike, abruptly called the work stoppage for 1 p.m. shortly after contract negotiations hit an impasse over pension and health benefits. The owners of The National Enquirer are in talks to sell the tabloid to Ronald W. Burkle, a supermarket magnate with ties to former President Bill Clinton, according to two people with direct knowledge of the negotiations. Eversource is waging war against its opponents in a bid to overturn the 2018 permit denial that doomed a pivotal deal to deliver electricity to Massachusetts. A report this week revealed how deeply involved human beings are in supporting Amazon’s audio devices. A pop-up business coaching session, a conference focused on innovation in Africa, and other events and things to know. Kirsner’s Innovation Economy column appears in the Boston Sunday Globe, and he contributes to the Globe’s Beta Boston website.